Whilst the result of this Baku race was hugely unexpected, the mechanics of how we got there was an absolute riot. More pieces of carbon fibre were swept away by the mechanics than remained running on track, and somehow we had two retirements become unretirements, only for the drivers to pick up similar penalties and both then retire from the race once more. There was a spot of road rage on display, a first time podium finisher, and a lot of tension as one of the fights went literally down to the wire. If you missed any of the action, and boy there was a lot of it, then read on for lap by lap highlights of the Azerbaijan Grand Prix. 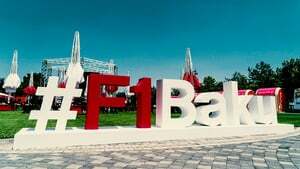 Hey there fact fans, welcome to live coverage of the Azerbaijan Grand Prix! You're all geared up and eagerly anticipating this one, aren't you? Yes? Yes? No, me neither, but hey, it could still be interesting. That's the thing about F1, you just never know what is going to happen. 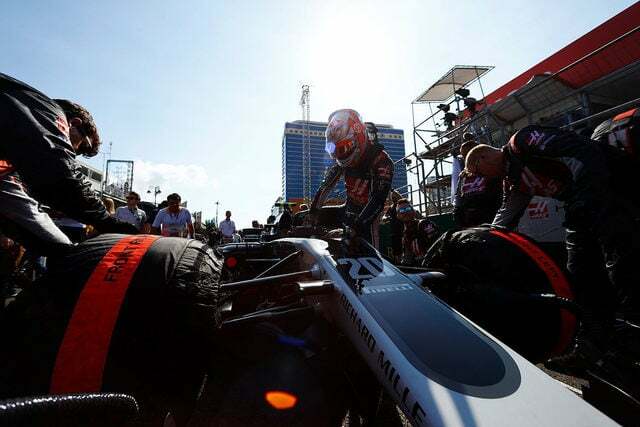 Last year, Baku hosted the European Grand Prix, but this time they've got the race in their own name, so it's the first running of the Azerbaijan Grand Prix. There's been a lot going on so far this weekend, with many drivers struggling to get through turn eight without incident, and plenty of locking up, running wide, and generally making things look difficult. The pit lane has opened, and cars are piling out to get their practice starts and installation laps completed. Hamilton snatched pole position yesterday ahead of Bottas for an all-Mercedes front row. Red Bull had been looking fast earlier in the weekend but had to settle for fifth. Ricciardo crashed in the final qualifying session, which made the fight for pole that much more interesting, but sort of ruined his day a little. Both the McLaren drivers have been hit with yet more huge engine related penalties, so they are at the rear of the field. Jolyon Palmer is last, though, after being unable to participate in qualifying following a fire destroyed his Renault in FP3. Tweet from @Max33Verstappen: My goal today is to gain a few places. That won’t be easy, but I’m up for the challenge! It's hot, hot, hot in Azerbaijan. Everyone on the grid is shading their eyes, or hiding under sun umbrellas. Max Verstappen, on the sweltering grid: Bit tricky. Let’s say we have a good start, everything changes. The most important thing on lap one is to stay out of trouble… it’ll be an interesting battle, I think, with Ferrari. The whole season, I don’t know what it is, a bit more grip, faster cars, it seems to suit me more than last year’s cars, so I’m really happy these rules came in. Stoffel Vandoorne, at the back of the grid: We saw a lot of mistakes on Friday, so I hope a little bit of mayhem is going to happen for us. Drivers have made their way to the front of the grid for the national anthem, and that super-huge flag is blowing beautifully in the breeze. Palmer has really been struggling this weekend. He came into the weekend in a bad mood and complained about always being asked why his season is so rubbish. Then he crashed into the barriers at turn eight, and then his car burst into flames. It's not quite McLaren bad, but still pretty bad. Magnussen climbs into his car with about ten minutes to go till lights out. Both Force India and Williams did a great job in qualifying yesterday. Lance Stroll got through to his second Q3, but it was the first time he was able to participate in the session, and he beat his teammate to eighth place. Tweet from @McLarenF1: Time for a final pre-race debrief with the boys and their engineers. Risk of rain - 0%. Looks like the majority of the field have opted for the softest of the three compounds, the supersofts, as their starting tyre. Only Grosjean, Ericsson and Vandoorne have got the soft yellow stripes on their cars, and they are 16th, 17th and 18th respectively. The track temperature has gone up a few degrees already, up to 51 from 48 when I posted the weather conditions earlier. Humidity down to 53%. The formation lap is go, some slow movers off the line but they've cleared the grid and the personnel are dashing back to the pit lane. It's a long old lap for Hamilton to lead the field round, warming up the tyres as best as possible. Jolyon Palmer has reported engine vibrations back to the engineers. That's a worry for the Renault crew. Last year a one stop strategy was the preferred option, but there's room for a two stop if the strategists so desire. Slow finish to the formation lap, but they're all in position now. Hamilton keeps his position into the first corner. Yellow flags for a couple of collisions. One of the Toro Rossos ran wide into the first corner and clipped his teammate coming back on track. Räikkönen and Bottas appear to have had another first lap collision, just like in Canada. The Mercedes crew are in the pit lane with a spare nose ready and waiting. Sainz was tipped into a spin by Kvyat. "Dany came back like a madman to the track," he reported. Replays of the other incident look like Bottas was out of control and hit the side of the Finn in the Ferrari. Vettel has surged forward thanks to the mayhem around him, he's now directly behind Hamilton - which is the battle we want to see for the championship. Bottas has had a supremely slow lap thanks to damage to his car, he's just made it back to the pit lane for a patch up. Team radio from Max Verstappen: "I think I have damage from debris." "We think you had debris in your rad duct." Bottas has rejoined the field a full lap down, already. That's going to be a difficult afternoon's work for the Mercedes driver. Turn 1 incident involving Daniil Kvyat and Carlos Sainz noted. Turn 2 incident involving Kimi Räikkönen and Valtteri Bottas noted. Räikkönen has been reporting some unusual handling of his car, which makes sense considering he was battered by Bottas. A huge battle is ongoing between the two Sauber drivers and the two Mercedes as well, Vandoorne leads Alonso with Ericsson ahead and Wehrlein tucked up behind the two. Closer replays show that Kvyat didn't actually hit his teammate, but the sight of a car rejoining like that scared Sainz into a spin. Romain Grosjean has taken an early pit stop to take on the supersofts and ditch the softs early. Hamilton out front and setting the fastest lap of the race at this early stage. Team radio from Marcus Ericsson: "I have no battery!" Pérez is up into third but he's being chased by Verstappen. Ricciardo has come into the pit lane for an early stop, doesn't appear to be any damage so just a mix of strategies for the Red Bull team. He's taken on the soft tyres, so speculation he might run to the end of the race from here. Turn 1 incident involving Daniil Kvyat and Carlos Sainz - no investigation necessary. Ricciardo's engineer tells him some debris was overheating the brakes but they've cleared it in that pit stop so now he's free to race. Turn 2 incident involving K Räikkönen and V Bottas - no action warranted. Jolyon Palmer reports smoke from the car, and then he's running slowly. He makes it back to the pit lane, and crawls to a halt with instructions to switch off his poorly Renault. Alonso is hustling Marcus Ericsson for 12th place, and oof, he outdrags the car ahead and takes the position. Team radio from Romain Grosjean: "I just ask for one thing Gary. If the car gets dangerous because of the brakes, please stop me." Hülkenberg is told: "We may have a blocked right front brake duct." Bottas has really spread debris far and wide. Yellow flags for Daniil Kvyat, whose Toro Rosso is sitting adjacent to the wall, gently smoking. Verstappen is on a mission to get past Pérez for that third place, but he can't make it stick early in the lap. He's jinking this way and that but Pérez has made that Force India as wide as possible. Oh no, Verstappen has backed off that battle with Pérez and his engine is sounding pretty sick. The Red Bull is still going but dropping down the order rapidly. Team radio from Max Verstappen: "Yep, here we go again." All drivers dive into the pit lane, Hamilton, Vettel, Pérez, Räikkönen, watch them all go. Räikkönen had a terrible stop, but Vettel's was good. Doesn't make too much difference at this point, with the safety car controlling the pace. Lance Stroll hasn't taken the opportunity to pit, so he's up to third place. Verstappen has made it back to the pit lane, and the mechanics are having a good look in and around the car to see if they can recover the situation. Nico Hülkenberg also opted not to come in for a safety car inspired pit stop. "It's the end for us," Verstappen is told, and that makes it four of the last six races that have seen a DNF for young Max. Lance Stroll has taken a pit stop this time round, on the face of it that's a poor decision, but the team probably didn't want to stack their cars. Ricciardo, meanwhile, has pitted for the second time, and has now taken on the supersofts once more. Meanwhile, the mechanics are still trying to figure out how to recover that Toro Rosso. Hülkenberg has also pitted, so everyone has now stopped at least once. Tweet from @TheMrJourneyer: This is good news for Bottas. With Hulk and Stroll stopping, that means he's not at the back, so he'll get to unlap himself. And there he goes, Bottas winds through the traffic and goes on his way. Now it's worth noting that the top nine drivers are all on the yellow striped tyres, with Ricciardo the first on the supersofts in tenth. Hamilton puts his foot down early, taking the restart very quickly. Vettel was caught napping and Pérez has closed right up behind the Ferrari. Pérez takes the position briefly, but then dropped back behind the Ferrari into turn two. Pérez is followed by Felipe Massa in the Williams, with Esteban Ocon close behind him. Marshal is dashing around on track picking up debris, and replays show that it's pieces of Räikkönen's car that just fell off under higher speeds. Although it looks like the marshals have finished their business. Hamilton gets a warning from the pit wall that he was close to passing the safety car before the line last time round. He argues that it was fine. At least three separate incidents at that restart explain why there is debris strewn everywhere. Team radio to Daniel Ricciardo: "Daniel, down this straight, stay in the middle of the track. Just watch for debris on the right hand side as you come to turn fifteen." Lots of weaving from all drivers, desperately trying to keep temperature in their tyres. Hamilton complaining about the speed of the safety car, again. He did that last time, and seemed to cope okay with the pace and the restart and all that jazz. Hamilton backed up hugely and Vettel bumped into the back of him... pulled alongside the Mercedes and road raged into the side. Drama! Two Force Indias collided, Ocon hit Pérez, who is dropping down the order. Räikkönen is running super slowly, he's got a puncture on his right rear tyre. Somehow, amongst the chaos, Felipe Massa is up into third, with Lance Stroll just behind him! Replays show Ocon was passing Pérez and just squeezed his teammate into the wall, there was nowhere Sergio could go. Ocon picked up plenty of damage too, and he's at the rear of the field as well. Kimi is trying to get back to the pit lane but that tyre is flapping around like crazy, and ripping his Ferrari to pieces. Both Force India drivers are in the pit lane. Räikkönen has made it back to the pit lane, and the mechanics have a quick look, but it's race over for the Finn. Ocon has rejoined the action, but it's not looking so rosy for Pérez. Turn 16 incident involving Sebastian Vettel and Lewis Hamilton noted. The marshalls are still dashing about recovering debris. Feel sorry for these chaps, in their second race weekend, it's chaos. All the cars are now returning to the pit lane and we can all take a breath! We're seeing replays of the Vettel/Hamilton incident. Hamilton does appear to slow a LOT in the corner, but there's not really an excuse for Vettel pulling alongside and bashing him in rage. Drivers are out of their car and engaging in various activities. Ricciardo is having a chat with Helmut Marko. Ocon also explaining himself to the team who don't appear to have sympathy for him. There are FIA bods loitering up and down the pit lane to make sure no one does anything they aren't supposed to. Grosjean is having a break in the garage, sitting on one of the mechanics chairs and looking up at the screens. Vettel has half taken his overalls off, helmet off, having a chat with the team. Alonso also deep in conversation with engineers. Turn 16 incident involving Sebastian Vettel and Lewis Hamilton under investigation. A bizarre contraption is running round the track - it's like a golf cart, slightly upgraded to be more like a batmobile, and it's pulling a rake of some sort behind it. Presumably this is a patented Baku Debris Clearing Vehicle. Race will resume at 18:15. Jolyon Palmer, retired on lap 9: "We had a misfire on the way to the grid, and it was just getting worse through the race and eventually we just had to stop the engine. It’s one of those weekends. I think I’ve done 30 laps this weekend, I’ve never had a weekend like it. It’s a shame, I was hoping for a chaos race, which is what’s happening out there." Making the most of the opportunity, the Force India crew have got Sergio Pérez's car back up and running. He'll join two laps down. Incredibly, we're not yet halfway through the race. Restart in just a few minutes. Pérez is instructed he'll be able to rejoin and gain one lap under the safety car rules. And now Ferrari have managed to get Räikkönen back out as well! Amazing work from the crews here. Pérez and Räikkönen are off, out on track unlapping themselves, whilst the rest of the field are now waiting to get the call to go from the pit lane. Yellow flags and safety car as Hamilton leads the pack out of the pit lane. Staggered that the FIA haven't come to any conclusion of the Vettel/Hamilton incident. Now they are in the exact same position with another safety car restart about to happen. It's happening again, Hamilton slows the pack up, Vettel isn't falling for it this time and pulls alongside. Hamilton gets away with Vettel close behind. Ricciardo bombs past two cars into the first corner to move into third place. Massa did report he might have a problem with his car, and he's dropped back behind his teammate to sit fifth. The replay of that Ricciardo move show a beautiful overtake - he just left braking far later than the other two, took the inside line and made it stick. Massa comes under pressure from Nico Hülkenberg, and then somehow Kevin Magnussen dives to the other side of them both and moves up into fifth! The Williams is bouncing down the track like crazy, and he's slowing considerably. Nico Hülkenberg has hit the wall, the front right wheel hanging off that Renault as he drops to the rear of the field. Felipe Massa has made it back to the pit lane but it's over for the Williams. Incidents involving Kimi Räikkönen and Sergio Pérez under investigation - working on the car outside of the fast lane. Double DNF for Renault as Hülkenberg is out with front wing damage. Team radio from Pascal Wehrlein: "Can I pass Marcus?" "If you're quicker, yes of course." Fernando Alonso is currently running sixth. Currently. Don't get excited. Long way to go. Haven't managed one of these yet, with all the stop/start action. Hamilton's head rest is wobbling at high speeds, looks like it could come off at any second. Hamilton gets the call about his head rest, "Just see if you can pull it back into position on the straight." He is trying. Team radio from Lewis Hamilton: "If this thing comes off, what's happening?" "Er, we're just having a look at the moment." Hamilton is called in to the pit lane, to get the headrest fixed. The crew are waiting in the pit lane, gaffa tape at the ready. Team radio to Lewis Hamilton: "We've been instructed, we have to pit this lap." 10 second stop/go penalty for Sebastian Vettel - dangerous driving. "When did I do dangerous driving?" Vettel asks, like an idiot. Hamilton pitted and rejoined down in ninth position. Vettel currently leads, with a penalty hanging over his head. Ricciardo is in line to inherit the lead here, with Lance Stroll behind him! Hamilton is sitting behind Bottas now, I can't see that situation lasting very long. Team radio to Kevin Magnussen: "Absolutely amazing job, you are in fourth position!" Vettel comes in to the pit lane, and sits in the pit box for the eternal ten seconds. And off he goes. No work done on the car by the crew, they just want him to get going as soon as possible. Vettel has rejoined just in front of Hamilton! Drive through penalties for Kimi Räikkönen and Sergio Pérez - working on the car outside of the fast lane. Team radio from Lewis Hamilton: "10 second penalty is not enough for driving behaviour like that." Let's just revel in the top three for the moment: Ricciardo, Stroll and Magnussen. Pérez and Räikkönen have taken their penalties, they're last and one lap down. Tweet from @ForceIndiaF1: Drive through for Checo. He serves it immediately and returns to track still ahead of RAI. Vettel makes a pass on Fernando Alonso, whilst the pair are distracted Hamilton moves in to position but doesn't have the space to take the position. Hamilton does make it past the McLaren and moves in seventh, still chasing the Ferrari. Grosjean is on the radio complaining about, you guessed it, his brakes. He thinks they are done. Hamilton is firmly in the rear view mirror of Vettel, he desperately wants to get ahead of his new nemesis. Romain Grosjean comes into the pit lane, race over for the Haas... disappointing when you consider his teammate is currently in line for a podium. Scratch that, Magnussen loses two places in one go - Ocon and Bottas have moved ahead. Super slo mo replays show the two Sauber drivers running far too close together, bit of carbon fibre goes flying, but they both appear to have escaped unscathed. Vettel overtakes Magnussen, but Hamilton follows him through so no breathing space for the Ferrari driver yet. Valtteri Bottas passes Esteban Ocon to move into third place. Great recovery from that early incident, that was admittedly his own fault. Vettel has closed the gap to Ocon super quickly, and is looking for a way past the Force India driver. Team radio to Sergio Pérez: "Checo, if your seat is really broken, we would have to retire the car." "Yea, it is really broken, I'm moving around." "Okay, then we're not happy." Pérez returns to the pit lane and retires from the race. Vettel takes the risk and passes Ocon with the smallest of margins against the following wall, but he's done it and moved into fourth. Tweet from @MarcusSimmons54: Sergio Perez is the first Mexican to retire twice from the same Grand Prix. Hamilton uses the DRS zone to catch and move alongside Ocon, and he holds the line. Ocon does a great job to leave enough space and the pair make it through the corner with Hamilton getting past. Team radio to Lance Stroll: "Okay Lance, we need green sectors every lap now." Sauber have now decided to get involved and allowed Wehrlein ahead of Ericsson, that's tenth place for Pascal. Team radio to Stoffel Vandoorne: "Points on offer if you can get both Saubers." Seems like Vandoorne was threatening to overtake Wehrlein there, so they allowed him to get past his teammate so as not to risk that final points position. Alonso has a 30 second gap to the Sauber behind, so his team offer him a pit stop if he wants. He declines but does say it's all quite risky in the corners. "Just bring it home," he is told. Sebastian Vettel sets the fastest lap of the race so far - 1:43.630. Hamilton asks if the team can get Bottas to slow down and deliver some dirty air to Vettel. However, Bottas is on a mission to try and catch Lance Stroll. He's got under six seconds to recover, and five laps to do it in. Lewis Hamilton sets the fastest lap of the race so far - 1:43.469. Vettel fastest lap this time round, they are both really pushing. Kimi Räikkönen has come into the pits again, and it's race over (again) for him too. The tension is high. Ricciardo leading. Can Stroll take second? What of Hamilton and Vettel? Hamilton just dips into the DRS range behind Vettel. Passing the backmarker of Romain Grosjean doesn't hold anyone up but is an obstacle everyone could do without. Daniel Ricciardo wins the Azerbaijan Grand Prix! Bottas pulled alongside Stroll and overtook him for second place AT THE FLAG. Amazing. Still amazing for Williams but my word that was close. Vettel fourth and Hamilton fifth. Team radio from Lance Stroll: "Oh no, he got me!" "Unlucky. P3, P3, mega job." FERNANDO ALONSO FINISHED IN THE POINTS. Tweet from @virtualstatman: Remember I said Vettel's never won from outside the top-3 on the grid? ALL of Ricciardo's F1 wins have been from outside the top-3! Daniel Ricciardo can't do much but laugh over the radio on the cool down lap, a crazy race ending in victory for him from tenth on the grid. As the guys get out of their car, there's plenty of congratulations for Lance Stroll. Anyone else exhausted? What a race that was, from a first lap collision, to multiple safety cars, red flag period, and final fight to the flag. And what a podium! Stroll takes to the third step, big smiles. Bottas, also happy. Ricciardo beaming. Great to see guys enjoying themselves up there. I anticipate a shoey at some point, so I'll stop watching now! Plenty to think about following that race. Red Bull will have picked up some motivation here, except poor Max Verstappen won't be happy with his equipment that keeps giving up. Williams also will have a huge boost, although they still have some way to go to catch Force India. Incredible scenes between Hamilton and Vettel today. Their rivalry may have been friendly up until now, but I doubt it will be going forward. And super glad to see Alonso picking up points for McLaren. It's too little too late, really, but it's something, and it shakes that monkey off his back for now. Räikkönen probably won't be too happy with Valtteri Bottas either, another first lap crash between the pair. And what kind of conversations will be going on between the teammates at Force India? We've got two weeks now before the Austrian race, a home event of sorts for the Red Bull crew. I'm already looking forward to it, see you then!